A Bed of Scorpions - Audiobook | Listen Instantly! Summer in London: the sun is finally shining, the flowers are in bloom, and life is humming merrily along for book editor Samantha Clair, off to lunch with her old friend, art dealer Aidan Merriam. Humming merrily until she learns that his partner has just been found dead in their gallery, slumped over his desk with a gun in his hand. Could anything be worse? Oh yes, the police investigation is being led by Inspector Jake Field, who just happens to be Sam’s new boyfriend. And Aidan, who just happens to be Sam’s ex-boyfriend, wants Sam’s help. Finding herself drawn into another investigation, Sam does the only sensible thing and calls her mother. Before long, Sam finds her loyalties stretched to the limit as she herself is threatened. 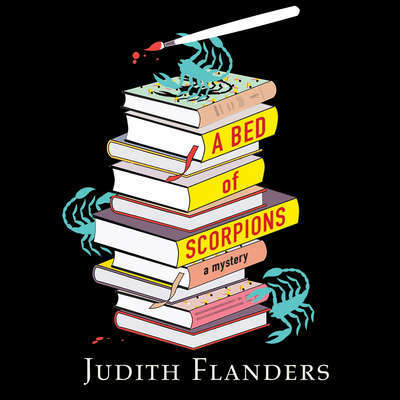 Armed with nothing more than her trusty weapons of satire, cynicism and a stock of irrelevant information culled from novels, Sam races to find a killer who is determined to find her first in the newest fast-paced, uproarious novel in the critically acclaimed series from New York Times bestselling author Judith Flanders. Judith Flanders is the international bestselling author of The Invention of Murder and one of the foremost social historians of the Victorian era. She is a contributor to the London publications Daily Telegraph, Guardian, Spectator, and the Times Literary Supplement. Before turning her hand to writing, she worked as an editor for various publishing houses, including the publications department of the National Portrait Gallery, London. Susan Duerden is an actress and an Earphones Award–winning audiobook narrator. Her reading of The Tiger’s Wife by Téa Obreht earned her an AudioFile Best Voice Award and a Booklist Editors’ Choice Award. She has won ten AudioFile Earphones Awards. Here career spans film, television, theater, voice-overs, and animation. She has played critically acclaimed and award-winning theatrical roles on London’s West End and Off Broadway; acted in the features Lovewrecked and Flushed Away; and held a recurring role on ABC’s Lost.